Breckenridge Brewery has three different locations in Colorado. The original in Breckenridge, on Kalamath in Denver, and the restaurant (which doesn’t brew) downtown by the stadium on Blake. Breckenridge is one of my favorite beers—and yes I have a few. Before I had visited the brewery, the Vanilla Porter and the Oatmeal Stout had been my favorite for years. Upon walking into the brewery on Kalamath, on the street or in the parking lot, you can smell the strong aroma of barbeque. It is a small location, compared to the brewery in Breckenridge, but it serves up some mean food-from pulled pork to salmon smothered in barbeque. 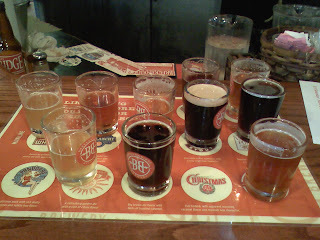 As for the beer…I ordered a sampler, which consisted of about 12 different beers. These beers included the Agave Wheat, and unfiltered wheat with agave nectar; Lucky U IPA, which is an American Indian Pale Ale with just the right amount of hops; Avalanche Ale; Trademark Pale, and of course the Vanialla Porter and Oatmeal Stout. I was also fortunate enough to sample a few of their 471 Small Batch Series (471 for the address on Kalamath). I absolutely loved the ESB-Extra Special Bitter. It’s double extra special bitter, and extra tasty. It’s available year around, in limited quantities. Other 471 include the 471 IPA, Mighty Brown an Imperial Brown style, and the Porter Porter. Be advised, the Kalamath location closes at 9 p.m. Mon.-Thurs., and a bit later on Fri. and Sat. Now, upon visiting the brewery on Blake Street, I was a little disappointed to learn that they did not actually brew the beer there. The restaurant is a large restaurant, which actually serves different food than the Kalamath location, it’s a nice place to eat and family friendly too. I much prefer bellying up to the bar on Kalamath. I would recommend visiting the brewery in Breckenridge if you have a chance, obviously it’s where it all started and it’s a great atmosphere in a cute mountain town.